NBA fans (and sometimes writers) often complain that the league no longer has truly great and emotionally resonant rivalries like it did in decades gone by. The general idea is that, with regular player movement and an AAU structure that forces them to interact at a young age, these athletes are too friendly to bring the same level of animosity to NBA competition. Something has been lost, and many want it back. The good news for people with this view is that Kevin Garnett exists. Though Garnett is very much of this same buddy-buddy generation, his manic intensity casts every basketball game he plays in as a war, complete with ridiculous gun analogies and all kinds of personal beliefs that we can only guess at. "I don't have Ray's number any more," Garnett said at the Celtics' media day at their training center on Friday. "I'm not trying to communicate. I'm just being honest with everybody in here... It's just what it is. Pressed on why he cut off contact with Allen, Garnett added, "I choose not to. I choose -- that's a choice I personally made. I told you all, I'm very close to Ray. I know his family. I wish nothing but the best for him and his family. I'm just making a choice on my own. That's all." Garnett, who signed a three-year, $36-million contract extension this offseason, suggested he was not upset with Allen's decision, but clearly wasn't thrilled with it after Boston reassembled its core from a season that ended against Miami in Game 7 of the Eastern Conference finals. "When a guy makes a decision based on him and his family, you can't ever get upset at that," said Garnett. "My personal feeling, I won't put into it. The only thing I'll say is I wish Ray the best. That's where it's at." I won't get into the cognitive dissonance of Garnett saying he's close to Allen and also refusing to keep in contact with him, because that's a psychological miasma for professionals to sort out. What I would like to discuss, though, is the logic of Garnett's approach as it relates to his rivalry with the Heat. 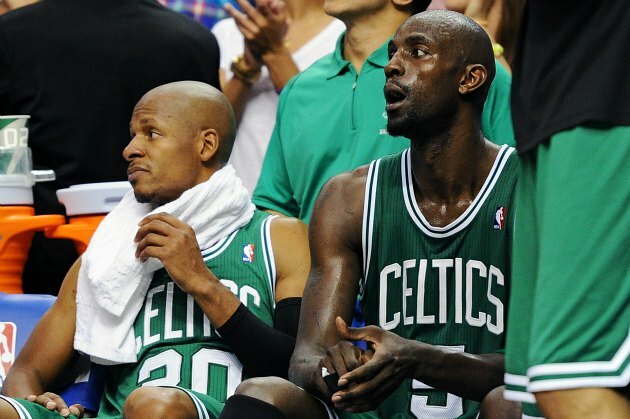 For five seasons, Garnett considered Allen to be a brother in arms, someone whom he could trust in times of professional crisis and in high-pressure moments on the court. However, over the course of a few days this summer, KG completely reversed course and considered Allen to be an enemy. He cut ties accordingly. That's his decision, of course, and he's entitled to make it. But the speed with which Garnett made the decision to cut ties helps demonstrate that the hatred is in many ways constructed. Over several years, KG formed a bond with Allen. In casting aside that relationship so quickly, he chose to forget that past relationship in order to gain a competitive advantage. That's fine, but it's a simplification of a complicated relationship with a former teammate. The Celtics and Heat will have an old-school rivalry this season, if only because KG has willed it into existence. But his approach seems to be the exception that proves the rule. Those rivalries no longer exist, but that happens for very good reasons. When players change teams and friends play each other in what's essentially a silly game, it's difficult to force hatred that doesn't exist. Why should players pretend there's all-out animosity when their emotional reality is so much more intricate than that?